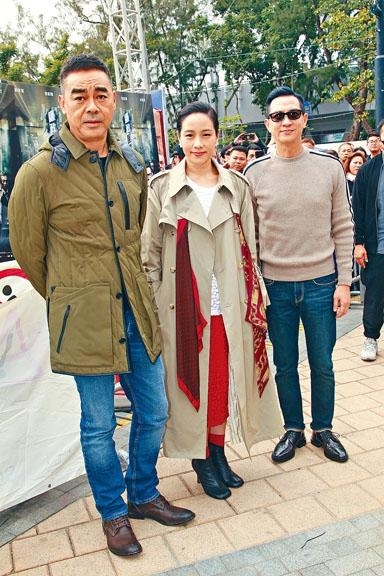 Sean Lau Ching Wan, Nick Cheung Ka Fai and Karena Lam Ka Yun yesterday promoted their Lunar New Year film INTEGRITY (LIM JING FUNG WON YIN MOK) at the Victoria Park Lunar New Year Market. Ching Wan and Ka Fai actually visited the Victoria Park New Year Market for the first time because they lived in Kowloon when they were little. Ching Wan said that when he was little and went to the New Year Market with his father, he loved to buy toys, plastic figures and fresh flowers. In recent years he would visit New Year Markets with his wife Amy Kwok Oi Ming, but they would choose to go in the afternoon when they would have less traffic. They used to buy peach blossoms but now they would not. Did they have too much luck? He denied, "No, we have no room at home." Ka Fai said that in his teens he would visit the New Year Market, mainly to eat fish balls and pork rinds. Ka Yun used to go to Causeway Bay, but she has not gone to the Market in a decade or so. She also has not taken her daughters either. Last night the trio after the film premiere would have to promote in Suzhou. Ka Fai complained, "It's been tougher than making a movie. A movie only have a dozen or so units, but the promotion has 20 to 30 units." Would INTEGRITY's serious subject differentiate it from other Lunar New Year films? Ka Fai said, "That's why it's great, it shows individuality and culture when you watch a serious movie for the Lunar New Year. You don't have to be funny, red, Kung Hei Fa Choi, although they would be in season; having a serious movie is a good choice. (Would you support other Lunar New Year films?) If time permits I would, let's see which one has tickets." Ka Fai also said that he would take his wife and daughter to the movies, maybe in disguise to see the audience response. Ching Wan also said that he would go with his wife. Ka Yun was the happiest because she could finally take her daughters to the movies. "I haven't tried it before because I was afraid that they would have heartaches from watching my crying scenes, screaming Mommy at the movies." Were they confident that they would be the Lunar New Year film box office champion? Ka Fai and Ching Wan both said that they were.